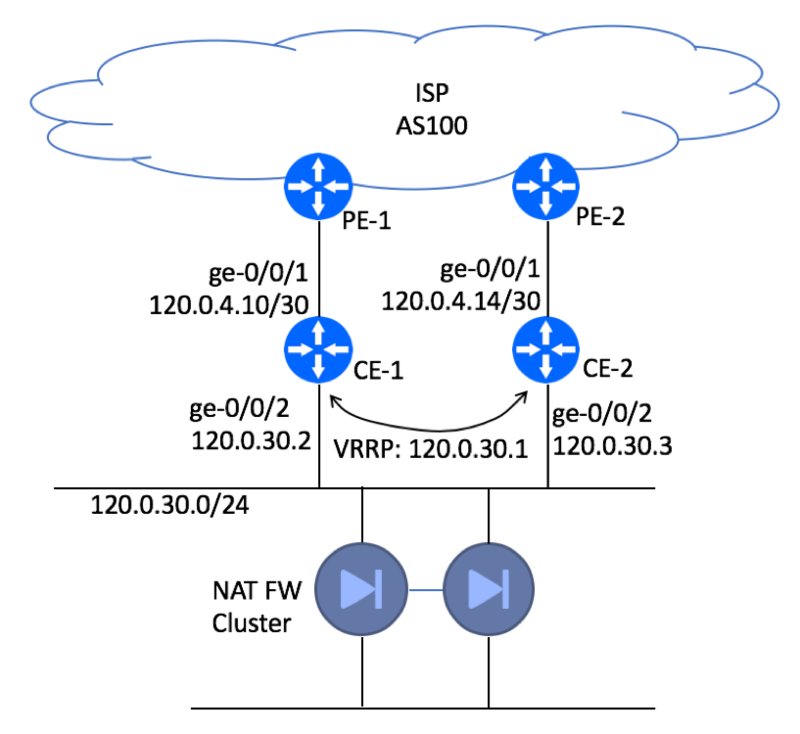 The goal of today’s exercise is to build a High Availability (HA) Site that would be dual-homed to different PE routers of the same upstream Internet provider. This is one of the common scenarios described in BGP for Enterprise Networks article. As you might recall, dual-homing to the same ISP does not require your company to acquire Public BGP AS and Provider Independent Internet-Routable IP Space, while providing protection against single link and/or CE failure. In our example, we will build the topology with two CE devices that will run VRRP between them. CE-1 to PE-1 link will be designated as the primary path, CE-2 to PE-2 will be used in case of the primary link failure. BGP Logical Topology for the dual-homing scenario is displayed below. EBGP sessions will be setup between CE and PE devices with IBGP session between two CEs. As mentioned earlier, CE-1 to PE-1 link will be designated as the primary path. In order to avoid asymmetric traffic flow (packets leaving the network via one CE but returning via a different CE), we need to make sure that CE-1 will be the preferred router for both Ingress and Egress traffic. In order to take care of the Egress traffic (customer site to ISP direction), CE-1 will be setup with a higher VRRP priority. We will also setup higher local preference (120) for the default route received via CE-1. For Ingress traffic, we need to find a mechanism to tell the ISP that routes received from CE-2 should be inferior to those received from CE-1. This can be achieved by either advertising special communities that are understood and supported by your ISP, or using AS-Prepend on CE-2 – PE-2 path. We’ll use the latter AS-Prepend approach, as it is universally supported by the majority of ISPs. set protocols bgp group ISP-AS100 neighbor 120.0.4.13 description "ISP FastAccess: Circuit GD8AJ12C: ISP NOC 800-111-2222"
set protocols bgp group IBGP authentication-key "$9$3Uey/A0EclLxdBIxdbsJZn/C"
You might have noticed that we are using internal interface IP as Router-ID and IBGP neighbor source. At a first glance, this might contradict a typical best practice recommendation of using router’s loopback address for this function. In our example, Loopback peering would not improve network stability, but introduce unnecessary complexity. Loopback peering is only required if you have multiple L3 paths interconnecting your CE devices. Those are not present in our example. Please note, that we are using Next-Hop-Self on our IBGP session. Refer to ‘Next-Hop-Self Explained’ article if you are not familiar with the concept. 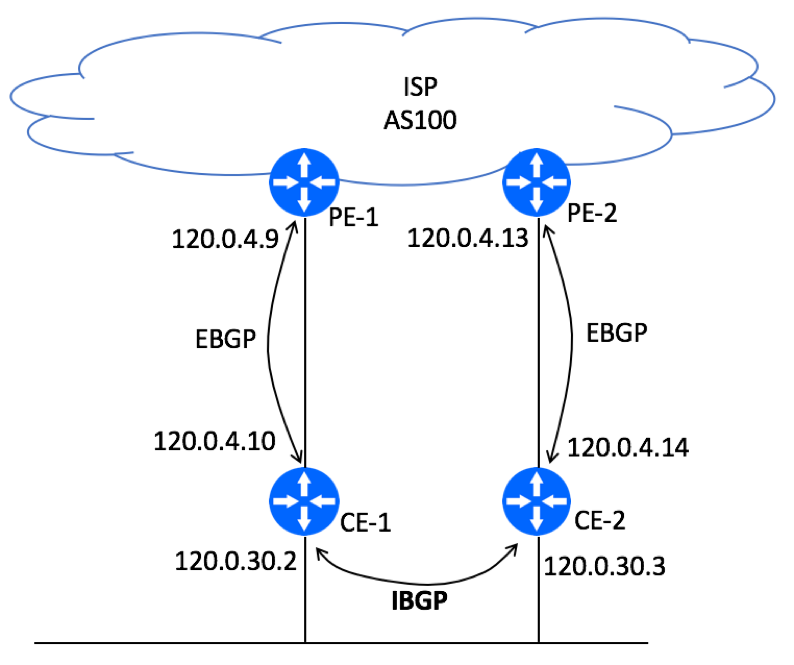 set protocols bgp group IBGP authentication-key "$9$tEpy01hevLVwgSrwgoJHkp0B"
set interfaces ge-0/0/1 description "CE1->PE2"
set interfaces ge-0/0/1 description "'CE4->PE2'"
Next Next post: What Routing Protocol Should I Use?